So I’d heard that the Merchant’s House Museum did candle lit tours, and I persuaded Katherine and Duncan to come with us and meet my sister, over from London for the weekend. Jon navigated the website and got the not-as-cheap-as-you’d-ideally-like tickets, and we were off. First of all, we sat in the dark and watched a video from the 80s about a guy who runs an occult website and thinks the place is haunted. He sets up recording devices by night, then listens to them in super loud amplification to see if he can hear the ghosts communicating. Mostly, we heard static, which, Could Not Necessarily Be Explained. Then our deadpan guide led us upstairs to a bedroom where a rich person lived a long and fulfilled family life, then died in their bed of old age. This is not the stuff of which great Ghost Stories are made. Duncan is a fellow Brit, Sarah and I have memories of relatives almost as old as the house, and Jon was brought up in a farm house that features in the Doomsday book, so a lot of the ancient mystical horror and foreboding was lost on us. We couldn’t help by feel sorry for the guide, who was trying her best to scare up some shivers. “We should come back at night and shout spooky things up at the windows so the ghost hunters have something to listen to on their recordings,” suggested Sarah. Make sure the cream cheese is at room temp. Sift in the icing sugar. Mix to combine and add the vanilla. 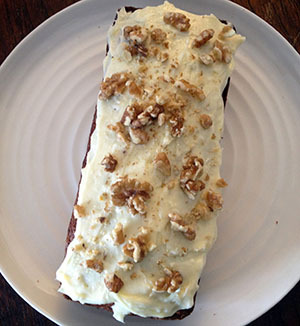 This entry was posted in Uncategorized and tagged cake, carrot, halloween, Merchant's House Museum, tea, walnuts. Bookmark the permalink.